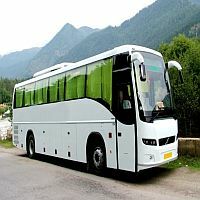 VIDYA TOURS AND TRAVELS is offering Bus Ticketing Services and is a Tour & Travel Company based in Mumbai (Maharashtra). The Bus Ticketing Services, which we are offering, are known for their speed and efficiency. Our team handles the formalities involved in Bus Ticketing with excellent planning so as to ensure that you have to worry about nothing. A journey by road has endless thrills and experiences attached to it and we wish to make the bus journey as enjoyable as it can be for you through our Bus Ticketing Services!